Giant second-harmonic generation in cantor-like metamaterial photonic superlattices. REYES GÓMEZ, Faustino; PORRAS-MONTENEGRO, Nelson; OLIVEIRA JUNIOR, Osvaldo Novais de; MEJÍA-SALAZAR, J. Ricardo. Abstract: We present a nonlinear transfer matrix method for studying the second-harmonic generation (SHG) in nonperiodic metamaterial photonic superlattices. 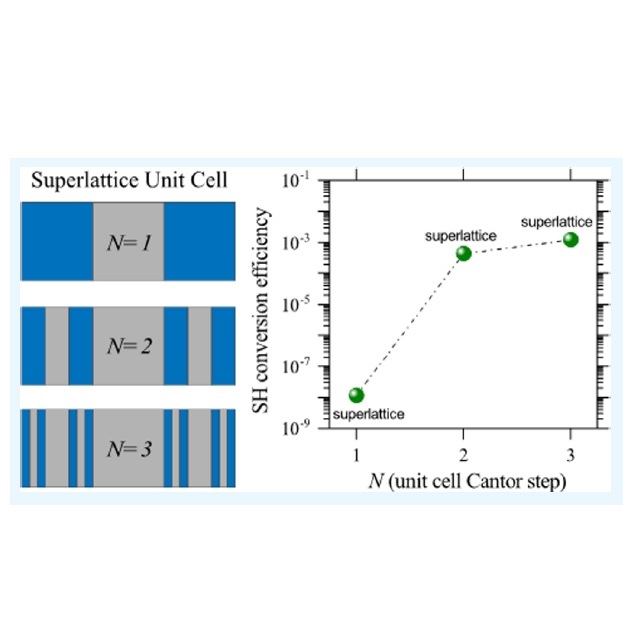 A large enhancement of up to 5 orders of magnitude in SHG efficiency was observed for superlattices made with a Cantor-like quasiperiodic assembly of a nonlinear material and a metamaterial. The enhancement was found to depend much more on the electric field amplitude along the structure because of self-similarity effects than on the amount of nonlinear material, which opens the way to design superlattices for tailored applications in broad-band tunable lasers.